Dagenham & Redbridge have been relegated from League Two after losing at Leyton Orient, ending their nine-year stay in the Football League. The Daggers, who reached League One in 2010, needed victory to keep their slim survival hopes alive. Goals from Jamie Cureton and Clevid Dikamona gave them hope after Jay Simpson fired the O's into a 2-0 lead. But Armand Gnanduillet fired in the winner to relegate Dagenham and keep Orient's play-off hopes alive. Dagenham reached the Football League for the first time in their history in 2007, but they now return to the National League under John Still, the same manager who took the club from the Conference to League One. The Daggers have League Two's worst goal difference, and have conceded 20 goals more this season than they had at this point last term. 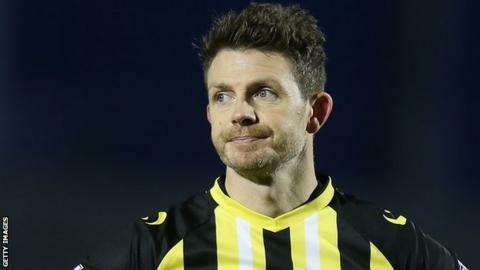 Still's side have also struggled in attack, with 40-year-old striker Jamie Cureton netting nine goals, compared to the 20 he scored as Dagenham finished 14th in the 2014-15 campaign. Boss Still, who returned for his third spell at the club in December, told BBC Radio London on Wednesday that he is committed to helping the Daggers gain promotion from the National League next season. Victory leaves Orient two points adrift of the play-off spots and comes four days after player-manager Kevin Nolan was removed from his managerial role. "For me to lose two managers this season has been very tough and I've found it very hard this week. "We had to be professional, we're here to do a job and if I wasn't professional then I wouldn't be true to myself. "We owe it to the fans. At the end of the day there's nobody bigger than the football club - the fans are the biggest part of the football club. "We made it a little bit nervy because we gave two sloppy goals away, but in the end that's what we need to do now - we need to win games if we're going to get into the play-offs." "I think for half an hour in the first half we lacked organisation and lacked discipline. "If you haven't got organisation and you haven't got the discipline to play 90 minutes, the outcome is inevitable. "Dagenham over the years are going to get beat, it's responding to that that the club's not been able to do this year." Match ends, Leyton Orient 3, Dagenham and Redbridge 2. Second Half ends, Leyton Orient 3, Dagenham and Redbridge 2. Corner, Leyton Orient. Conceded by Mark Cousins. Attempt saved. Blair Turgott (Leyton Orient) right footed shot from outside the box is saved in the centre of the goal. Attempt saved. Jay Simpson (Leyton Orient) left footed shot from the centre of the box is saved in the centre of the goal. Attempt saved. Joss Labadie (Dagenham and Redbridge) right footed shot from the centre of the box is saved in the centre of the goal. Attempt missed. Clévid Dikamona (Dagenham and Redbridge) header from the centre of the box is close, but misses to the right. Attempt saved. Matt Richards (Dagenham and Redbridge) right footed shot from outside the box is saved in the bottom right corner. Corner, Leyton Orient. Conceded by Quade Taylor. Attempt blocked. Lloyd James (Leyton Orient) right footed shot from outside the box is blocked. Attempt missed. Joss Labadie (Dagenham and Redbridge) right footed shot from more than 35 yards is too high. Clévid Dikamona (Dagenham and Redbridge) wins a free kick in the attacking half. Attempt missed. Jay Simpson (Leyton Orient) header from very close range misses to the right. Substitution, Leyton Orient. Jack Payne replaces Nigel Atangana. Attempt missed. Jay Simpson (Leyton Orient) right footed shot from the centre of the box is too high. Attempt missed. Jay Simpson (Leyton Orient) right footed shot from outside the box is too high. Corner, Dagenham and Redbridge. Conceded by Shaun Brisley. Substitution, Dagenham and Redbridge. Matt McClure replaces Matthew Cash. Joss Labadie (Dagenham and Redbridge) is shown the yellow card for a bad foul. Attempt saved. Ollie Palmer (Leyton Orient) header from the centre of the box is saved in the bottom left corner. Substitution, Dagenham and Redbridge. Luke Pennell replaces Justin Hoyte. Goal! Leyton Orient 3, Dagenham and Redbridge 2. Armand Gnanduillet (Leyton Orient) right footed shot from the centre of the box to the top right corner. Assisted by Blair Turgott.